The non-profit group Invisible Children has made recent efforts to resurrect its “Kony 2012” campaign that flourished greatly in early March. These efforts quickly crumbled as people discovered the impracticality of the plan, how donations were actually being used and, of course, the public naked breakdown of the film’s mastermind, Jason Russell. On Oct. 17, the organization released another video on YouTube entitled “Move” in an attempt to salvage its reputation and message. This attempt at resurfacing the campaign, however, is and will prove to be unsuccessful in regaining large support. There are no doubts that the first video released by Invisible Children was insanely successful—in initially garnering donations and spreading awareness of Joseph Kony’s war crimes across Africa. When the video was first released, many people naively gave their support and donated feverishly to Invisible Children. Currently the video has over 94 million views. According to research on the Invisible Children from charity watchdog group charitywatch.org shows that only about 37 percent of its funds directly aid the Africans they say they are helping, while the rest is allocated to filming expenses and employee compensation. This didn’t bode well with supporters who bought the infamous “Kony Kits,” comprising merely of some stickers, buttons, a t-shirt, and posters with “KONY” labeled on it. These “action kits” cost $30 and many people posted on Yahoo! forums saying that they never received them. Though Invisible Children has not released the exact breakdown of where this $30 goes, much of it probably pays for outstandingly pricey 30-minute YouTube videos and well-paid salaries for Invisible Children employees. When the Kony 2012 video found its way to Uganda, it sparked outrage. Malcolm Webb, Uganda-based correspondent for news source Al Jazeera, caught a screening in Northern Uganda where villagers were so offended by the video that a riot broke out and rocks were thrown at the video screen. The video was seen as inaccurate and it even provoked Ugandan Prime Minister Amama Mbabazi to create a YouTube video refuting the film, saying that the situation is much more complex than the Invisible Children depicts it. To add insult to injury, Jason Russell was found in San Diego in a state of psychosis, running around naked and interfering with traffic. He apparently was suffering from stress, dehydration and exhaustion. Displaying the spillover effect, some now associate the Kony 2012 campaign with the video coverage of Russell’s naked rampage, further discrediting Invisible Children. The demise of the Kony 2012 movement was exemplified when Invisible Children’s “Cover The Night” activity received very little support. 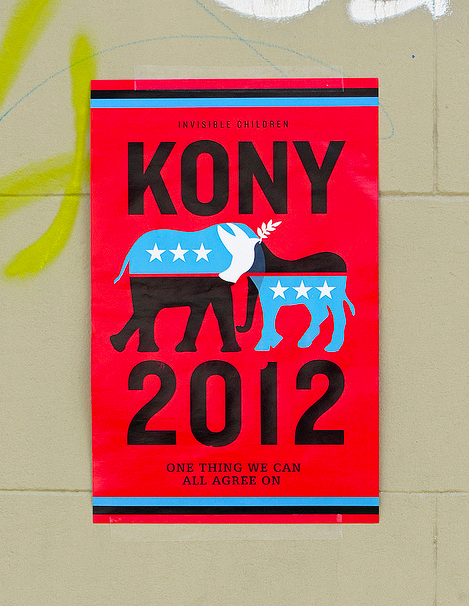 This event, advertised in the first video, encouraged supporters to “cover” towns with Kony posters to spread awareness. The meek gathering of the few left followers was a direct result of the skeptical response caused by the destructive events previously described. Using emotional cinematic effects (as usual), the new video “Move,” tries to explain Russell’s breakdown and reinforces the Kony ideology. Despite these new efforts, the video is wildly unpopular compared to the first one (“Move” currently has about 153,000 views), a product of the damage caused by the first films aftermath. “Move” promotes another “call to action” event, pleading for all supporters to go to Washington D.C. on Nov. 17 to protest the government. It looks very unlikely that the organization will effectively woo back their once huge support group. The predicted small turnout for Nov. 17 will probably further show the effects of the irreversible damage done to harm Invisible Children’s reputation to the point of no return.